Tap Forms has a very powerful label design engine built-in. You can select from over 1000 Avery® label templates, customize the built-in templates, or create your own from scratch. Before you can select a label template, please create a new custom layout and choose the Labels option next to the Design for property in the Layout Inspector panel on the right. Once you do that, you’ll see the Select a Label button appear. Please see the Layout Designer chapter for more information. 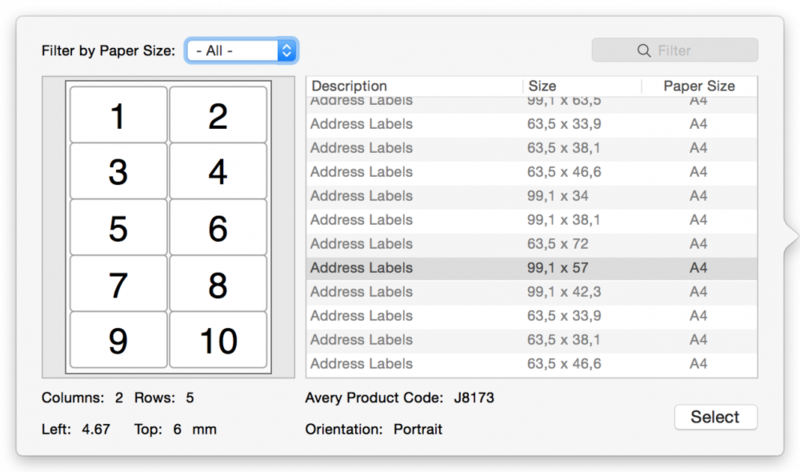 You can filter labels by paper size or you can enter in a keyword or Avery Product Code to help you find the label type you’re looking for. Click the Select button when you’ve found the label template you’re looking for. To customize the selected label or to create your own label from scratch, click on the Edit Label button. You can also choose to print the same label per page or you can select the Multiple records per page option which will tell Tap Forms to print a different record on each label. Printing the same record for each label would be very useful for printing something like a Business Card where you want the same information printed on each card. 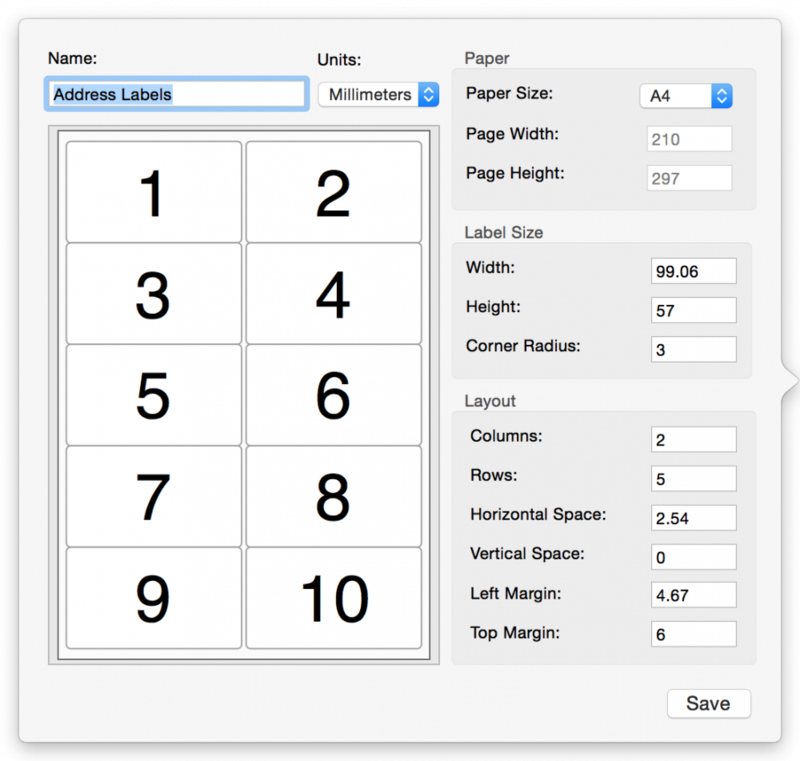 Printing multiple records per page would be perfect for printing Address Labels where you want a different address on each label. *If you don’t see the Multiple Records Per Page option, drag the horizontal divider bar on the layout inspector panel down a little bit to reveal that option. After you’ve selected or edited your label format, it’s time to drag fields into the layout designer area and customize the design of your label. To get a larger view of your labels, adjust the zoom level to be higher than 100%. *To print your labels, select the Print function from the File menu and make sure you have the Details (1 record per page) option selected. 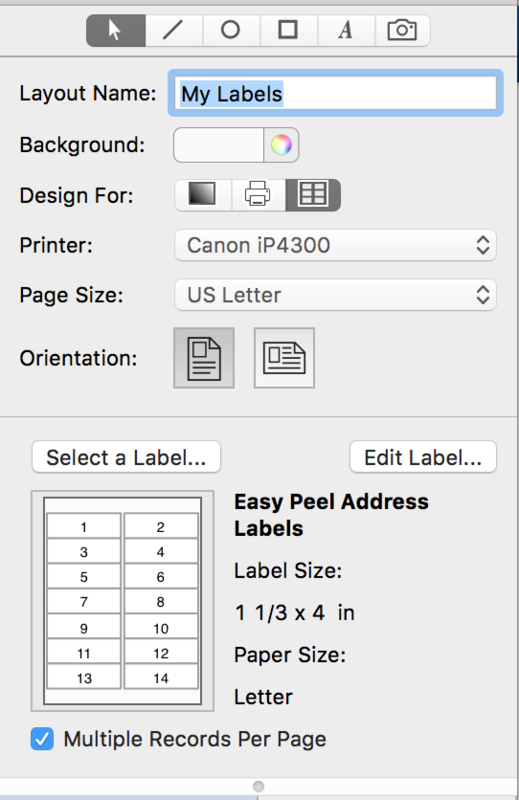 Note, if you have Multiple records per page enabled for your label, you will still get multiple records per page printed, despite what the Details option says.